Bühlmann, P. and van de Geer, S. (2011). 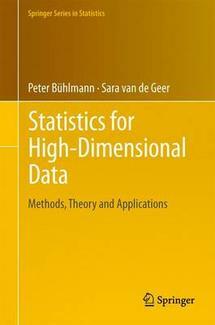 Statistics for High-Dimensional Data: Methods, Theory and Applications. Springer. Statistical Analysis for High-Dimensional Data. The Abel Symposium 2014. Edited by Frigessi, A., Bühlmann, P., Glad, I.K., Langaas, M., Richardson, S. and Vannucci, M. (2016). Springer. 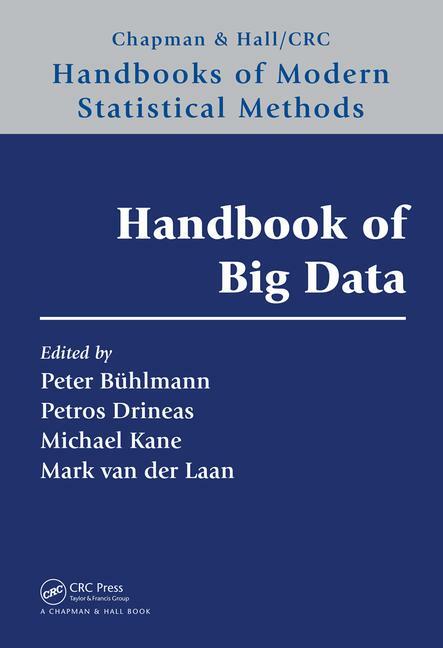 Handbook of Big Data. Edited by Bühlmann, P., Drineas, P., Kane, M. and van der Laan, M. (2016). Chapman & Hall/CRC. Ruiz-Sola, M.A., Coman, D., Beck, G., Barjaa, M.V., Colinas-Martinez, M., Graf, A., Welsch, R., Rütimann, P., Bühlmann, P., Bigler, L., Gruissem, W., Rodriguez-Concepcion, M. and Vranova, E. (2016). Arabidopsis geranylgeranyl diphosphate synthase 11 is a hub isozyme required for the production of most photosynthesis-related isoprenoids. New Phytologist 209, 252-264. Bühlmann, P. and Cai, T. (2011). Introduction to the Lehmann special section. Annals of Statistics 39, 2243. Buller, F., Steiner, M., Frey, K., Mircsof, D., Scheuermann, J., Kalisch, M., Bühlmann, P., Supuran, C.T., Neri, D. (2011). Selection of carbonic anhydrase IX inhibitors from one million DNA-encoded compounds. ACS Chemical Biology 6, 336-344. Kalisch, M., Fellinghauer, B.A.G., Grill, E., Maathuis, M.H., Mansmann, U., Bühlmann, P. and Stucki, G. (2010). Understanding human functioning using graphical models. BMC Medical Research Methodology 10:14, 1-10. Download paper. Dahinden, C., Ingold, B., Wild, P., Boysen, G., Luu, V.-D., Montani, M., Kristiansen, G., Sulser, T., Bühlmann, P., Moch, H., Schraml, P. (2010). Mining tissue microarray data to uncover combinations of biomarker expression patterns that improve intermediate staging and grading of clear cell renal cell cancer. Clinical Cancer Research 16, 88-98. Bühlmann, P. (1994). Blockwise bootstrapped empirical processes for stationary sequences. Annals of Statistics 22, 995-1012. Bühlmann, P. (1995). The blockwise bootstrap for general empirical processes of stationary sequences. Stochastic Processes and their Applications 58, 247-265. Bühlmann, P. and Künsch, H.R. (1995). The blockwise bootstrap for general parameters of a stationary time series. Scandinavian Journal of Statistics 22, 35-54. Bühlmann, P. (1995). Moving-average representation for autoregressive approximations. Stochastic Processes and their Applications 60, 331-342. Bühlmann, P. (1996). Locally adaptive lag-window spectral estimation. Journal Time Series Analysis 17, 247-270. Bickel, P.J. and Bühlmann, P. (1996). What is a linear process? Proceedings National Academy of Sciencies USA 93, 12128-12131. Bühlmann, P. (1997). Sieve Bootstrap for Time Series. Bernoulli 3, 123-148. Bickel, P.J. and Bühlmann, P. (1997). Closure of linear processes. Journal of Theoretical Probability 10, 445-479. Bühlmann, P. (1998). Extreme events from return-volume process: a discretization approach for complexity reduction. Applied Financial Economics 8, 267-278. Bühlmann, P. (1998). Sieve bootstrap for smoothing in nonstationary time series. Annals of Statistics 26, 48-83. Bühlmann, P. (1999). Efficient and adaptive post-model-selection estimators. Journal of Statistical Planning and Inference 79, 1-9. Bühlmann, P. (1999). Dynamic adaptive partitioning for nonlinear time series. Biometrika 86, 555-571. Extended version (compressed postscript). Bühlmann, P. and Bühlmann, H. (1999). Selection of credibility regression models. ASTIN Bulletin (Journal of the International Actuarial Association) 29, 245-270. Bühlmann, P. and Künsch, H.R. (1999). Invited Comment on "Prediction of Spatial Cumulative Distribution Functions Using Subsampling (Lahiri, Kaiser, Cressie and Hsu)". Journal of the American Statistical Association 94, 97-99. Bühlmann, P. and Künsch, H.R. (1999). Block length selection in the bootstrap for time series. Computational Statistics & Data Analysis 31, 295-310. Bühlmann, P. and Wyner, A.J. (1999). Variable length Markov chains. Annals of Statistics 27, 480-513. Bickel, P.J. and Bühlmann, P. (1999). A new Mixing Notion and Functional Central Limit Theorems for a Sieve Bootstrap in Time Series. Bernoulli 5, 413-446. Bühlmann, P. (2000). Von Daten zu stochastischen Modellen (in German). Elemente der Mathematik 55, 1-18. Compressed postscript. Bühlmann, P. (2000). Model selection for variable length Markov chains and tuning the context algorithm. Annals of the Institute of Statistical Mathematics 52, 287-315. Compressed postscript. Bühlmann, P. and Yu, B. (2000). Invited Discussion on "Additive logistic regression: a statistical view of boosting (Friedman, Hastie and Tibshirani)". Annals of Statistics 28, 377-386. Compressed postscript. For original paper (Annals of Statistics 28, 337-407) click here. Audrino, F. and Bühlmann, P. (2001). Tree-structured generalized autoregressive conditional heteroscedastic models. Journal of the Royal Statistical Society: Series B 63, 727-744. Compressed postscript. Bühlmann, P. (2002). Sieve bootstrap with variable length Markov chains for stationary categorical time series (with discussion). Journal of the American Statistical Association 97, 443-456. Compressed postscript. Bühlmann, P. (2002). Rejoinder of "Sieve bootstrap with variable length Markov chains for stationary categorical time series". Journal of the American Statistical Association 97, 466-471. Bühlmann, P. (2002). Bootstraps for time series. Statistical Science 17, 52-72. Compressed postscript. Ango Nze, P., Bühlmann, P. and Doukhan, P. (2002). Weak dependence beyond mixing and asymptotics for nonparametric regression. Annals of Statistics 30, 397-430. Compressed postscript. Bühlmann, P. and Yu, B. (2002). Analyzing bagging. Annals of Statistics 30, 927-961. Compressed postscript. Bühlmann, P. and McNeil, A.J. (2002). An algorithm for nonparametric GARCH modelling. Computational Statistics & Data Analysis 40, 665-683. Compressed postscript. Dettling, M. and Bühlmann, P. (2002). Supervised clustering of genes.Genome Biology 3(12): research0069.1-0069.15. Software. Dettling, M. and Bühlmann, P. (2003). Boosting for tumor classification with gene expression data. Bioinformatics 19, No. 9, 1061-1069. Compressed postscript. PDF. Software. Mächler, M. and Bühlmann, P. (2004). Variable length Markov chains: methodology, computing and software. Journal of Computational and Graphical Statistics 13, 435-455. Click here. Dettling, M. and Bühlmann, P. (2004). Volatility and risk estimation with linear and nonlinear methods based on high frequency data. Applied Financial Economics 14, 717-729. PDF. Teuffel, O., Dettling, M., Cario, G., Stanulla, M., Schrappe, M., Bühlmann, P., Niggli, F. and Schäfer, B. (2004). Gene expression profiles and risk stratification in childhood acute lymphoblastic leukemia. Haematologica 89, 801-808. Wachtel, M., Dettling, M., Koscielniak, E., Stegmaier, S., Treuner, J., Simon-Klingenstein, K., Bühlmann, P., Niggli, F. and Schäfer,B. (2004). Gene expression signatures identify rhabdomyosarcoma subtypes and detect a novel t(2;2)(q35;p23) translocation fusing PAX3 to NCOA1. Cancer Research 64, 5539-5545. Wille, A., Zimmermann, P., Vranova, E., Fürholz, A., Laule, O., Bleuler, S., Hennig, L., Prelic, A., von Rohr, P., Thiele, L., Zitzler, E., Gruissem, W. and Bühlmann, P. (2004). Sparse graphical Gaussian modeling of the isoprenoid gene network in Arabidopsis thaliana.Genome Biology 5(11) R92, 1-13. Wille, A. and Bühlmann, P. (2006). Low-order conditional independence graphs for inferring genetic networks. Statistical Applications in Genetics and Molecular Biology 5 (1) Art1, 1-32.Download paper. Prelic, A., Bleuler, S., Zimmermann, P., Wille, A., Bühlmann, P., Gruissem, W., Hennig, L., Thiele, L. and Zitzler, E. (2006). A systematic comparison and evaluation of biclustering methods for gene expression data. Bioinformatics 22, 1122-1129. Download paper. BicAT: A Biclustering Analysis Toolbox. Hothorn, T., Bühlmann, P., Dudoit, S., Molinaro, A. and van der Laan, M. (2006). Survival ensembles. Biostatistics 7, 355-373.Download paper. Meinshausen, N. and Bühlmann, P. (2006). High-dimensional graphs and variable selection with the Lasso. Annals of Statistics 34, 1436-1462. PDF. According to Essential Science Indicators, this has been selected as New Hot Paper. Dahinden, C., Parmigiani, G., Emerick, M.C. and Bühlmann, P. (2007). Penalized likelihood for sparse contingency tables with an application to full-length cDNA libraries. BMC Bioinformatics 2007, 8:476, 1-11. Schöner, D., Kalisch, M., Leisner, C., Meier, L., Sohrmann, M., Faty, M., Barral, Y., Peter, M., Gruissem, W. and Bühlmann, P. (2008). Annotating novel genes by integrating synthetic lethals and genomic information. BMC Systems Biology 2008, 2:3, 1-14. Bühlmann, P. and Yu, B. (2008). Invited Discussion on "Evidence contrary to the statistical view of boosting (D. Mease and A. Wyner)". Journal of Machine Learning Research 9, 187-194. Download paper with discussion. Lange, V., Malmström, J. A., Didion, J., King, N. L., Johansson, B. P., Schäfer, J., Rameseder, J., Wong, C.-H., Deutsch, E. W., Brusniak, M.-Y., Bühlmann, P., Björck, L., Domon, B. and Aebersold, R. (2008). Targeted quantitative analysis of Streptococcus pyogenes virulence factors by multiple reaction monitoring. Molecular & Cellular Proteomics 7, 1489-1500. Download paper. Buller, F., Zhang, Y., Scheuermann, J., Schäfer, J., Bühlmann, P. and Neri, D. (2009). Discovery of TNF inhibitors from a DNA-encoded chemical library based on Diels-Alder cycloaddition. Chemistry & Biology 16, 1075-1086. Bühlmann, P. (2001). Time series. Encyclopedia of Environmetrics (eds. El-Shaarawi, A.H. and Piegorsch, W.W.) , Vol. 4, pp. 2187-2202. Bühlmann, P. (2004). Bagging, boosting and ensemble methods. In Handbook of Computational Statistics: Concepts and Methods (eds. Gentle, J., Härdle, W. and Mori, Y. ), pp. 877-907. Springer. Hothorn, T., Dettling, M. and Bühlmann, P. (2005). Computational inference. In Bioinformatics and Computational Biology Solutions using R and Bioconductor (eds. Gentleman, R., Carey, V., Huber, W., Irizarry, R. and Dudoit, S.), pp. 293-312. Springer. PDF. See also here. Bühlmann, P. (2006). Boosting and l^1-penalty methods for high-dimensional data with some applications in genomics. In From Data and Information Analysis to Knowledge Engineering (eds. Spiliopoulou, M., Kruse, R., Borgelt, C., Nürnberger, A. and Gaul, W.), pp. 1-12. Studies in Classification, Data Analysis, and Knowledge Organization, Springer. Schöner D., Barkow S., Bleuler S., Wille A., Zimmermmann P., Bühlmann P., Gruissem W. and Zitzler, E. (2007). Network Analysis of Systems Elements. In Plant Systems Biology, Series: Experientia Supplementum (eds. Baginsky, S. and Fernie A), pp. 331-351. Birkhäuser. Audrino, F. and Bühlmann, P. (2007). Synchronizing multivariate financial time series. In The Value-at-Risk Reference (ed. Danielsson, J. ), pp. 261-291. Riskbooks. Bühlmann, P. (2013). Comments on Robust Statistics. In Selected Works of Peter J. Bickel (eds. Fan, J., Ritov, Y. and Wu, C.F.J. ), pp. 51-55. Springer. Bühlmann, P. (2016). Partial least squares for heterogeneous data. In The Multiple Facets of Partial Least Squares and Related Methods. PLS, Paris, France, 2014 (eds. Abdi, H., Esposito, V., Russolillo, G., Saporta, G. and Trinchera, L.), pp. 3-15. Springer. Bühlmann, P. (1999). Bootstrapping time series. Bulletin of the International Statistical Institute, 52nd session. Proceedings, Tome LVIII, Book1, 201-204. Bühlmann, P. (1996). Confidence regions for trends in time series: a Simultaneous Approach with a Sieve Bootstrap. Tech. Rep. 447. UC Berkeley. Superseded by Bühlmann (1998): Sieve bootstrap for smoothing in nonstationary time series (see above No. 10). Bühlmann, P. (2002). Consistency for L2Boosting and matching pursuit with trees and tree-type basis functions. Superseded by Bühlmann (2006): Boosting for high-dimensional linear models (see above No. 43). Wille, A. and Bühlmann, P. (2004). Tri-Graph: a novel graphical model with application to genetic regulatory networks. Superseded by Wille and Bühlmann (2006): Low-order conditional independence graphs for inferring genetic networks (see above No. 41). Bühlmann, P. and Yu, B. (2005). Boosting, model selection, lasso and nonnegative garrote. Superseded by Bühlmann and Yu (2006): Sparse Boosting (see above No. 46). Wille, A., Bleuler, S. and Bühlmann, P. (2005). Integrating gene expression data into flux balance analysis. Schöner, D., Dahinden, C., Gruissem, W. and Bühlmann, P. (2009). Robust prediction of hubs in the yeast synthetic lethal network.